Zac Bates shows of his balletic prowess. Photo: Cindy Nitsos. It really was a no-win situation. Given our erratic performances so far this year, our unsettled match-day squads, our coaching change, and our inability to score with any regularity, there are few if any South fans who are optimistic about our chances of progressing to the national stage of this tournament. However that didn't mean that people were necessarily keen on losing this game; at least not until the last 15 minutes or so, knowing that actually progressing through to the next round could summon a worse fate, in the form of a more severe mauling against a more capable opponent. Or even worse, distracting us from what looks like being another season battling to avoid relegation. If we found a way to lose this game, the loss would've been rightly called a disgrace. If we'd won it comfortably, it would've been written off as achieving the bare minimum against a lowly opponent, again rightly so. In its own way, it was reassuring that the team managed to find a third, worse option than either of the preceding two: scraping through on a goal courtesy of a long-ball, and a header by one of our defenders placed into the path of another of our defenders, who slotted home like he was an actual striker, and all of that helped by the Royals defenders deciding they didn't need to track back. So what kind of result would have placated our fans on Friday? 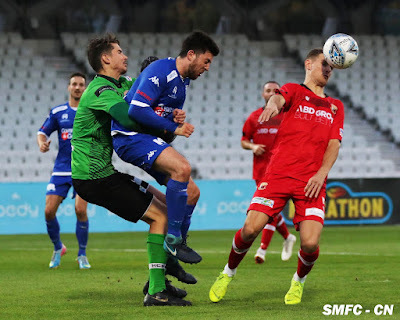 Against a state league 1 opponent at the bottom of their division - and with no 'name' players, with the exception of Melbourne Knights also-ran striker Chris Talajic - probably nothing short of 4 or 5-0 win. Well, that didn't happen, and thus we are miserable. This miserable state was enhanced not just the failure to second, third, and fourth goals, but also by the performances of some players. Giordano Marafioti got a start, looked dangerous at times (as he should against a state league 1 team if he's serious about this whole NPL business), but failed to take advantage of two very good chances in the first half; one from point-blank range, and another where he was one-on-one with the keeper. At under 20s level, missing those is less of a crime, because playing for South under 20s means you're going to get a heap of those chances; in the seniors, not so much. Brother Pep was brought back in from the cold after two weeks away from the senior squad - due mostly, if one believes to the rumours, to a poor attitude on the training track - and failed to deliver. His lack of a right-foot was highlighted again, and even as one of his few prominent defenders, I can't help but think this is as good as we're going to get from Pep. He's been tried on the left, the right, and up front, and for the most part nothing has worked, and only some of that can be put down to playing in unsettled formations and unfamiliar positions. Worst of all, after being benched around the hour mark, Pep proceeded to spit the dummy and march down the players race instead of taking his place back on the bench. So, that's probably someone we can chalk down as exiting the club come mid-May when the mid-season transfer window opens. But who to put in his place? 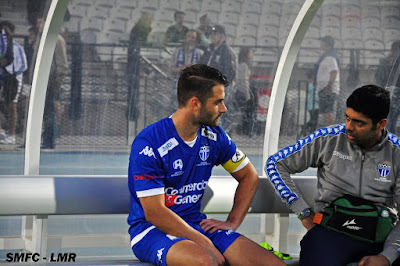 Well, we could do worse than Zac Bates, who showed a bit when he came on to the field (yes, it was only against a bottom of state league 1 club), but his speed was terrific at least, and he didn't look emotionally cooked after an early season spent injured and on the bench. Ben Djiba also continued to look good at right-back, as well as continue to provide the perplexing spectacle of an actual South Melbourne youth team player starting in the side (and not returning to the club to do so after several years away elsewhere) and looking competent. More perplexing, and hopefully no serious ramifications come from this, was Kristian Konstaninidis being benched after an hour. 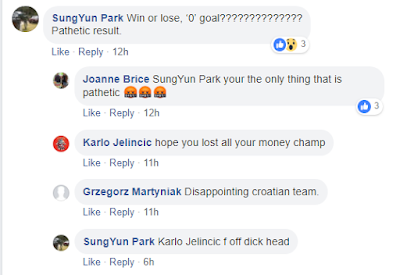 One would've thought that KK could use all the game he could get, but he was subbed off to the confusion (and some disgust) of a few people, not least KK himself. Someone in forum land is saying that the substitution occurred because of a lost-in-translation moment between player and coach, and hopefully because we did win the game, that the misunderstanding is smoothed over, because we need a left-back desperately in lieu Brad Norton's absence with injury. For all the angst about the performance, the Royals rarely threatened our goal. There was a goalmouth spill which was eventually cleared, and a sharp header straight at Roganovic. Then the Royals threw everyone forward towards the end, as you would expect. We hit the woodwork two or three times and missed some very gettable chances, which made things more difficult for us, as it has for most of this season. There was even a moment where it looked like we might get an unlikely penalty, when a Royals defender assumed a ball had gone out and thus rushed to hand it to his keeper (who was the Royals' reserve keeper, who had a solid game), only for there being the possibility that the ball had not actually gone out. Soon enough the officials decided that no player could have possibly been that stupid, and normal service resumed. Anyway, because we could not find a second goal, we spent the last five minutes cowering in the corner. Not that there's anything wrong with that - it's what you should do when you're in front, and trying to secure the win - but it was unedifying within the context of having to do that against a side ranked two divisions below us. The hyperbolic reaction to the win would be to say that the squad is at best a mid-tier state league 1 side, but that's why you don't rush home and post straight away. For those of us who haven't quite yet obliterated the quaint desire to see their team win games no matter how aesthetically coarse the method, the win was appreciated, even if the performance still left a lot of questions left to be answered. As always, it could've been worse! Other NPL clubs lost or barely scraped through against similarly or even less credentialed teams than the Royals. 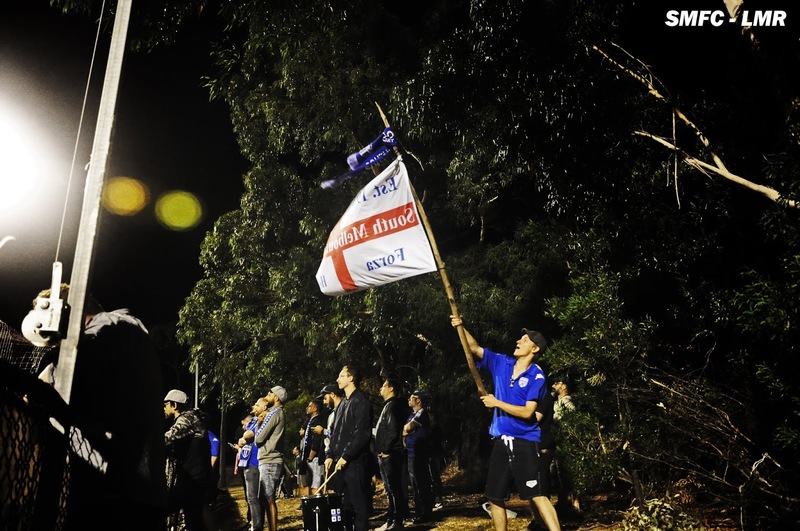 Of course no one cares about those other NPL teams and their near or actual failures, because they are not carrying South Melbourne cultural baggage. 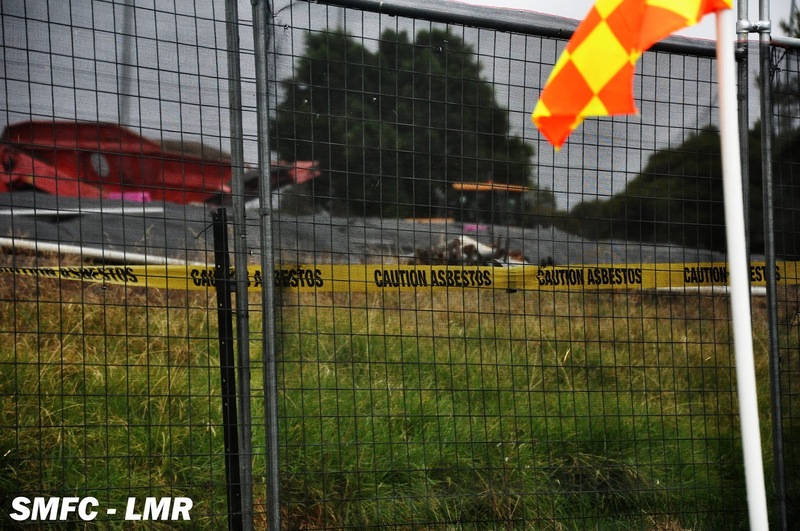 It's the price we pay for continuing to support Australia's has-been soccer club. There were new, limited edition hats and caps available at the merch stand, for those who care about such things. Some of them were trucker hats. Not being a trucker, it didn't seem right for me to buy one. Plus I already have my pompom beanie anyway, and who cares if the temperature is pushing 30 degrees in the middle of April. It was good to see Nikola Roganovic come out with a hat in the second half - not only is that sun-smart, but it also helps avoid situations like this. More confounding was Gerrie Sylaidos' choice of head-wear. By now we are all familiar with the fact that he wears a sort of light beanie during games, usually a white one. But what was the deal with the navy/dark variation used in Friday? It was very warm out there, and we all know that dark colours absorb light and/or heat much more than light colours do. Well, after complaining that last week's stadium music, once again we had some variation of the Queer as Folk soundtrack. And then at half-time, we had some variation of a Triple M All-Time Greatest BBQ/Driving/Drinking songs compilation. Is that an improvement? Yes, I suppose so. If you're wondering where exactly I hope my complaints about the stadium music selections end up, it's with the soundtrack to SimCity 3000 being played over the public address system in all of its light-jazz, proto-vaporwave glory. Dandenong Thunder away next Saturday night. Since the match falls on Orthodox Easter Saturday. I was out and about on Saturday morning trying to fix the gaping existential hole in my life by purchasing some music on compact disc (it didn't work), and after discussing the merits of El Perro Del Mar's self-titled album (it's ace in its depressive interpretation of '60s girl groups) and the Manic Street Preachers and Richey Edwards' disappearance, the store's proprietor noticed my South Melbourne hat. Well, that led to a discussion about second divisions and such, and also about Western United, which said shopkeeper said he would support because he lived in the area - until such point as I made the pithy comment that he'd have to be driving to Geelong and Ballarat until Western United built their ground, if indeed it ever got built. Hardly the most thrilling story, I know. 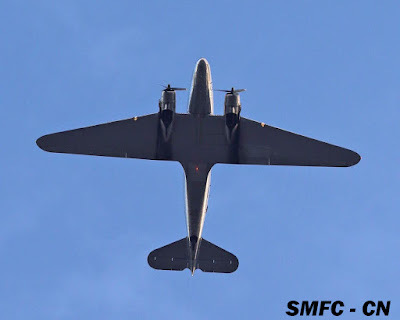 "Look at the sky and spot the planes, where would I go on holidays?" Whatever positive buzz had been carried over from the previous week's win against the Knights disappeared within four minutes of kickoff. If we fall behind at any stage in a game this year, there's little chance we are going to win the game. After nine weeks, you just have to admit that's the way it's going to be. Sure, there might be the odd goal pulled back for a lucky draw, but for the most part we're cooked when we're behind, no matter how hard we try and how close we get. Luke Patitsas said, and I agree, that most games this year when they've been 0-0 have felt like we've been behind. And look, the first goal we conceded was comical, but Hume should've scored from that chance anyway. After that, it was the usual: we had a ton of possession and played well enough to earn a goal ourselves, but it wasn't going to happen. You can blame the lack of an actual striker and extra 'unnecessary' passes, but empty nets at the back post and missed headers are opportunities which should be taken by anybody. The second goal we conceded was even more comical than the first, but since we weren't going to score anyway, Hume putting it away is almost a moot point, unless we end up getting dragged down by that one goal, which in any case would be silly, because a season doesn't usually hinge on a moment in round 9 and not all the other goals you cop. There are people doing deep analytical dives into the formation and the setup and all that, and good luck to them. I'd join in with my amateurish takes, but I'm just too tired. My solution (and it's not so much a solution as pining for the obvious) is that hopefully when Billy Konstantinidis returns from suspension (and assuming he can play out the majority of a match) we can stop with the makeshift strikers and false nines. By the way, Billy's initial five match suspension was reduced to four thanks to a guilty plea, so he should be back for the game against Thunder away when league action resumes in a week and a half's time. Whether other potential forward options such as Manny Aguek, and Pep and Gio Marafioti can redeem themselves in the eyes of Esteban Quintas - who had them dropped for poor training ground discipline - remains to be seen. The Heimlich maneuverer being performed on the field is a new one for me. There were some crazy tackles in this game. Not necessarily malicious, but just bizarre. In the first half there was a sliding high-booted kick somewhere between Liu Kang and Johnny Cage. There was one moment where a Hume player inadvertently got his legs caught around (I think) Jake Marshall's head, while Marshall was basically standing upright. Aside from those strangenesses, there worst behaviour for me, which was never called out, was the constant manhandling of Leigh Minopoulos during his half or so on the field. The groping and molestation of Leigh was bizarre, and never went punished. Speaking of Leigh, there's chitchat going around that he's been appointed as an assistant coach. Strange, if true. Brad Norton was subbed off 20 minutes from time on Sunday. More immediately pressing is Brad Norton reputedly getting a hamstring injury. 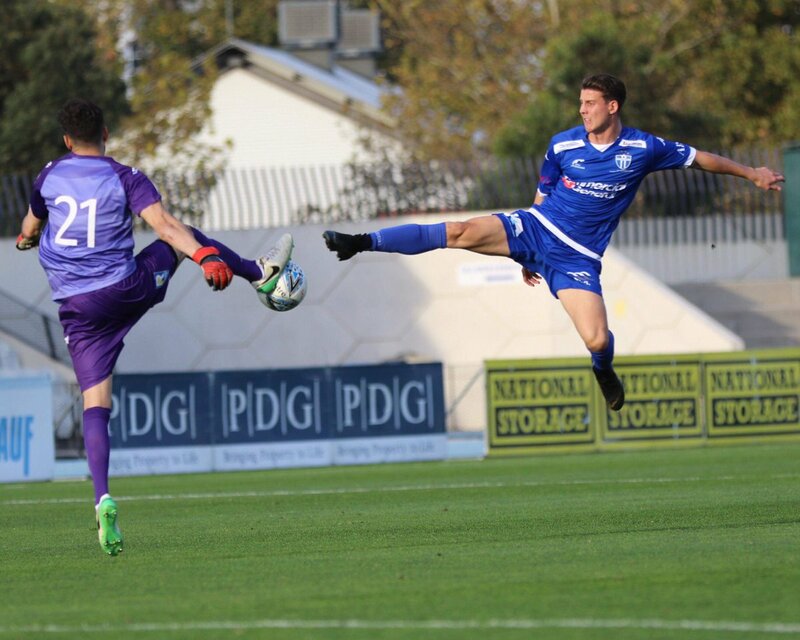 That saw Perry Lambropoulos brought on for the last part of the game, which makes you wonder what's going on with Kristian Konstantinidis that he can't even get a run with 20 minutes to go in a game that we're chasing. Thank goodness that, for the time being, there are three teams in this league doing worse than us. It won't last, but it at least gives us a false sense of hope to cling on to. FFA Cup Round 4 against Essendon Royals at Lakeside on Friday afternoon. Not many of us seem to hold any hope that we'll get anywhere near the national stage this year, and that all our efforts should be directed at not getting relegated. Fair enough. Still, you wouldn't want to lose this one, especially against a State League 1 opponent which has only managed to (I think) get one point from four matches, and which has seen its coach (Michael Curcija) resign on Tuesday. It was too damn warm to sit outside and watch the women's game against Heidelberg, so we stayed inside instead and watched the game on the live-stream. Despite there many screens available to us, I think I missed almost every single goal scored in this game. That included the one goal we scored to open the game, and all but one of the five we ended up conceding. I did see Heidelberg miss a penalty, but the game was cooked by then. It seems like the women's team is in a massive transition phase. No Lisa De Vanna; Chelsea Blissett gone to Young Matildas; Tiff Eliadis retired to more social football; Amy Medwin preparing for a US college gig; and Melina Ayers looking to sign with a lower division US team. Add to that the injury on Sunday to Sofia Sakalis, and things are looking more difficult than perhaps people would've anticipated. Still, that means someone else has the chance to step-up and make the grade and all those other cliches. As often happens, when there are new people on hand in the social club, things take a little longer than you would like just to order something and pay for it, but once that was sorted, I got my burger very quickly because this time they were pre-made instead of being pumped out on order. This was fine by me, and the burgers were solid, but one regular reader was upset that he was unable to get a burger without cheese. I have no idea why the kitchen staff would not accommodate his request, and I have even less idea why he would think that having his complaint posted on South of the Border would make any sort of difference. But here we are, fulfilling this request of his to have the matter on record.s. I am also hearing reports that merch that people wanted to see available was not available yet. This happens. More accurately, this happens every year. Even more accurately, this happens every year despite assurances that it won't happen this year. As I noted on Sunday afternoon, the only person at South Melbourne who has actually managed to deliver on a merch promise in a timely manner is the bloke who got me the hooped socks. Now don't mistake this as me being bitter, because I'm not. I got the item I wanted after a decade long wait earlier this year, and so far as I'm concerned, everyone else can please their Kappa-wearing selves. I uploaded the match program from the recent Knights game. You can find it at the usual page. Nothing much happened either at the game I was at on Friday night or whatever live-streamed game I flicked on during the halftime break - I think it was Paco vs Knights. I'm calling it now - Altona East is cooked in 2019. The only thing that will save them will be some ridiculous end-of-season restructure, the kind of thing that happens with unnerving frequency in Victorian soccer. And all this after East scored within the opening two minutes from a penalty against recently promoted Epping City. After a sluggish start, the fluoro yellow kitted visitors worked their way back into the game, and scored from a penalty of their own after about 20 minutes. Thereafter the game ebbed and flowed amiably as well as meaninglessly, with a lift in intensity in the last ten minutes of the half. But Epping took control of the second half, scoring early, and never letting East get a chance to respond. Even Epping's profligate play in the box only served to delay the inevitable, which was made even more inevitable when's East's keeper got sent off ten minutes from time and had to be replaced by outfield player. The most excitement on the day was the three or four blokes watching the closing minutes of the Geelong vs GWS match on a phone, who were getting all agitated because they either barracked for Geelong or had a bet on the game. It used to be blokes huddled around a transistor radio, now it's this. Victorian soccer folk change in detail, but not in substance. Very disappointed that Teo Pellizzeri has departed Football Victoria. He'll be an incredible loss to Victorian soccer, but he'll be some other organisation's gain. Even if our official interactions were limited, he was always good to South of the Border with regards to media passes and such, and using some of our better gags during the radio broadcasts. Hopefully we'll still see him around the traps. There are members of the South Melbourne family who view '30' as the magic number this year. It's the magic number because, barring some bizarre turn of events where teams at the bottom end of the table collect an inordinate amount of points, even greater than last season - 30 points will be enough to see you survive. We're now a third of the way there, having endured a coaching change, erratic form, an unfortunate suspension, and an absence of home games, with two thirds of the season to go. For some reason all during the week there was this sense of anticipation about this game. Granted it was mostly coming from Knights fans, who were promoting the bejesus out of the game (as is their right), and getting ready to bask in the glory of victory, but still, it all felt a bit confected to me. That's probably due to us sucking and them not sucking, and expecting to get beaten, even though I personally haven't thought that highly of Knights' performances this season despite their better than expected results. There was also plenty of inane banter in the lead-up, which I had nothing to do with because I carry myself with the utmost internet decorum , but you people... boy, you just can't resist. How dare you even remotely question the Knights' poster campaign? Aren't you scared that the singing man on the Knight Train radio show or one of his acolytes is going to come after you and teach you Greek words? Anyway, the (apparent) great tragedy about this rivalry - apart from these two once mighty clubs being stuck in the state leagues - is that for the last 25 odd years there have been few moments when both clubs have been at the top of their leagues at the same time. There have been blips - like the 2013 semi-final - but even that was dependent on us making an outrageous run in the second-half of the season and benefiting from the Southern Stars to even make the finals. So after several years of us being quite good, and Knights being garbage, this year it is the Knights who have been good and South who has been middling. A large crowd was in attendance, but the atmosphere was muted. There was some some chanting from Knights fans, but they were close to inaudible in the second half. The flatness of the crowd was matched by a flatness to the game as well. Knights had the better of it, especially towards the end of the first half - and only heroics by Nikola Roganovic (in league game 100 for us), and a clearance off the line keeping it level. The second half from us was better and Knights seemed to lose the ability to do some of their more intricate passing. At any rate, their falling behind played into the hands of a team that will prefer sitting back and hitting on the counter until such time as we get a proper striker and attacking midfield set-up. This game was decided by a goal to us, and a very fine and enjoyable and comical goal it was too. A crappy turnover in midfield, four passes, and Brad Norton with the finish after a gut-busting 80 metre run. It was Brad Norton's first goal for the club in two seasons, and just our sixth goal this season. Putting all that to one side for the moment, I love everything about this goal. Its straightforwardness is of course a major appeal. The Knights fan yelling out 'chase!' even though Norton is already flying past the defender. Leigh Minopoulos leaning over to his left looking around a corner to make sure the ball goes in. The fact that Norton actually scores, of course. The laughter you can hear on the video is also a treat. All that, and the way it fulfils every Knights fans' fantasy, that they lose so many games to us that they have dominated. To be fair, they did have the better chances in this game, but it's not like we weren't threatening in our own way. Had we been able to hit a proper through pass in the first half, we may have created even more chances than we did. The bigger problem from our end is that even with three nominally defensive midfielders, there were stretches of the game where we struggled to gain possession. There were the standard moments of indecisiveness in defence, and too many times where we went back to the keeper, but for the most part we defended well enough; which is not the same thing as great, but a step forward nevertheless.. The three points aside, the most pleasing aspect of the game for mine was the polished and mostly poised game of Ben Djiba, who started at right-back instead of Perry Lambropoulos. Apart from a solid defensive performance, Djiba also managed to get up the field and provide an attacking option. Djiba came off injured in the second half - hopefully he's OK - and Knights immediately attacked his replacement Lambropoulos; but Perry held his own well enough, which was also a good sign. Just because one prefers one player to start over another, it doesn't mean you want the less appealing player to struggle when he's on the field. Hume City at home - at Lakeside! - on Sunday. The curtain raiser will be the senior women taking on Heidelberg at 1:30. 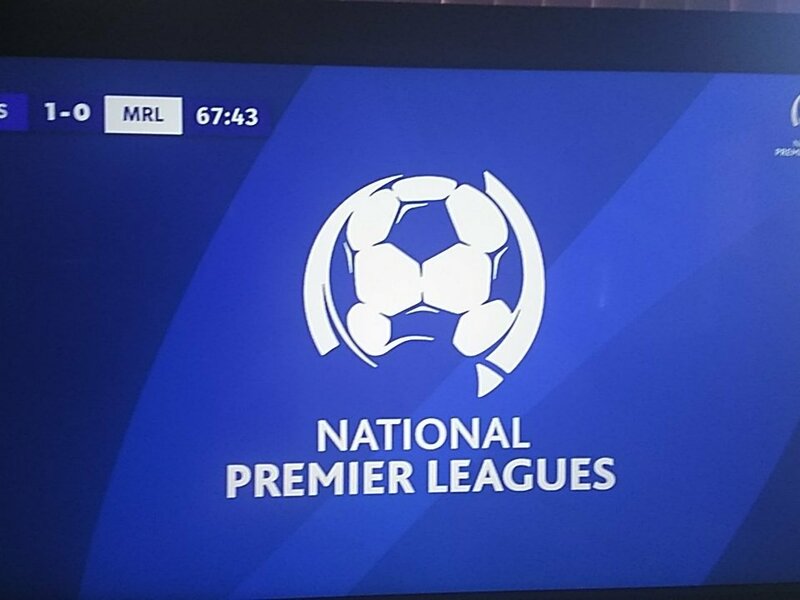 One thing the NPL live streams have come in handy for is for when you're at the MCG on a Friday, or Saturday or Sunday, and you need something to fill in some time while you're waiting for a game to start and try in vain to block out the noise of the stadium music and announcements and kisscams and dancecams. Caught twenty odd minutes of Altona Magic vs Bentleigh, and apart from Sami Nour scoring with a nice volley, this was a hard game to watch because every few minutes someone went down like they were shot. 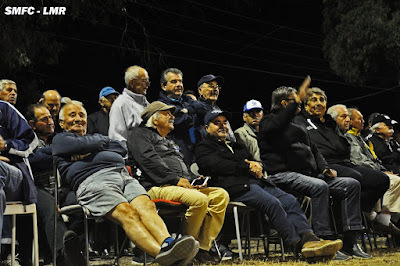 There being no curtain raiser on Friday night, one had to wait around for an hour at Knights Stadium doing not very much except wait for other people to show up, and then wonder about the squad choices made by Esteban Quintas. As is their way these days, Knights have standalone senior matches for their Friday night home games, with the under 20s punted to Sunday afternoons. It makes sense I suppose. Come Sunday, I could've gone to Somers Street again to watch the under 20s game, but I didn't want to. I preferred to stay home and watch it on a live stream, partly for the absurdity of watching an NPL under 20s game on a live stream. Who could possibly be interested in this? Don't answer that. Our boys dominated the early proceedings, in part thanks to a strong breeze, and Manny Aguek could've had a hat-trick within the opening 15 minutes, but he didn't. 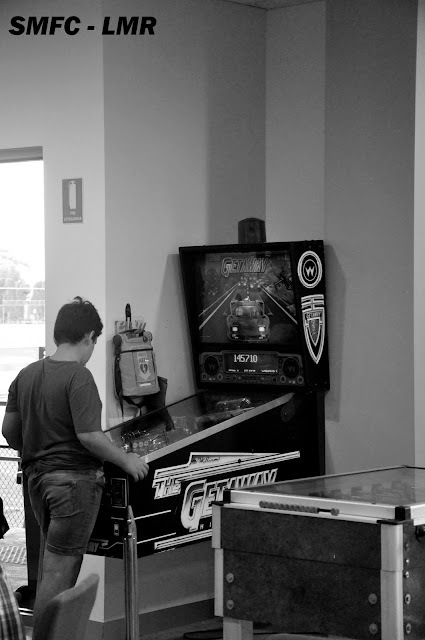 The game deteriorated to the point where it was hard to keep attention. Knights seemed to steady the ship in the second and had a bit more of the play, but a player of theirs that had apparently gotten injured was laying out the back of the southern goal, and eventually an ambulance turned up which delayed the game for about 15 minutes. Hopefully the kid is OK. In recent seasons these kinds of situations have seen games abandoned, but this one resumed at about 77 minutes or so. 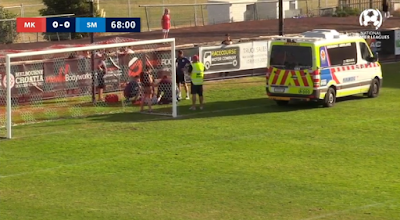 A miscalculation by the Knights keeper coming off his line made things easier for Gio Marafioti to score what would be the only goal of the game. Usual practice for under 20s/reserves games is for there to be no injury time, but here the game went to about the 102 minute mark. Manchester United at Olympic Park in 1967. Great work by George Cotsanis of the My World Is Round Facebook page and of course The Pioneers show on FNR. Last year he bought some reels of film off eBay, and got them digitised. The footage includes a half-hour long film of Manchester United touring Australia in 1967, with games - in colour! - against Victoria and New South Wales - as well as some junior soccer. 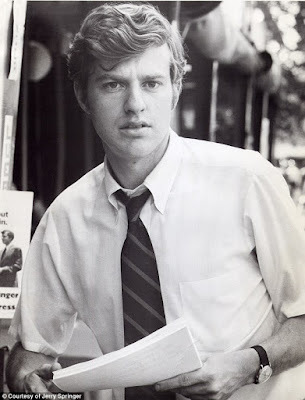 Mark Boric provides a run-down and some background information on his blog about that film. As part of this haul, George Cotsanis has also managed to unearth footage of Torpedo Moscow vs Victoria from 1965. Mark Boric also has some background on this game on his blog. Lastly, there's a brief film of the touring Roma side watching Richmond and St Kilda at the MCG. I think I've seen that footage or footage like it before; certainly I've read about the Roma players at that game, probably in the VFL Record. Please, please, please share these videos with your friends, especially among your Man United friends and family. One may ask what's the point of trying to create a buzz about a game and a club, and deploying tons of volunteers all over the place, and trying to build a family-friendly environment and putting up #eraseNCIP and pro-rel banners, if a minority of goons is still intent on trying to intimidate and attack opposition fans by stealing scarves. One may say it's a minority, but it seems to happen more regularly than it should, and it makes you wonder if some people at Knights actually condone that kind of behaviour. I suppose we should be glad that this time at least, the goon's mates (and fiance?) convinced him to back off. Word had got around last night that Con Tangalakis was out, and today the club confirmed that news. The club have framed it as a resignation, which will do little to convince at least a good chunk of our support that it was a sacking in all but name. After a positive start to the season, further wins have failed to materialise in the past four weeks. Some misfortune aside - Billy Konstantinidis' early season absence and later suspension among that bad luck - the weekly lineup put out on the field by Tanga never seemed to match what many fans thought was the optimal set up. Two visa spots used up on defensive midfielders has also stumped people, but no issue has been as contentious as the usage, lack of usage, and misuse of Gerrie Sylaidos. Putting whatever conspiracy theories may exist aside for a moment, the one thing I can say with some certainty is that there was obvious friction between Tangalakis and long-serving players, who could not understand Sylaidos being removed from the field when matches were on the line. What if any influence this actually had on Tanga's resignation only those close to the action know for sure. Tanga helped get us out of a jam last year, with a team not of his own making. He used some youngsters, fought against an alleged fifth column from within the squad, as well as rumours that the club wasn't up to speed with its player wages. Yes we needed a bit of luck to avoid the relegation zone, but he was in charge when we avoided the drop. He handled himself well as the club sought to bring back John Anastasiadis. There were always going to be those who doubted Tanga's suitability for a coaching gig at a club like South. Whether out of necessity or by natural occurrence, the budget is not what it was in recent years. Some of the pre-season recruiting, but especially the pre-season match selections, which emphasised variety over cementing a definitive starting eleven, had fans concerned. But in the first three games at least, a good performance against Bentleigh, and two wins over Dandy City and Port, had people optimistic. Not just for the wins - whose performances were arguably not as good as the Bentleigh game - but for the way the team was playing. An expected loss against Avondale could be psychologically brushed aside, but the losses against Kingston and Pascoe Vale were in their own way devastating - we could've/should've beaten teams like that, but the failure to do so has us much closer to the relegation zone than anyone would be comfortable with. Why after the draw with Green Gully though, and not say, after the FFA Cup with Essendon Royals, I don't know. Maybe they didn't want to repeat last year's mistake of letting what some may consider free-fall to continue unabated. Maybe someone's trying to head off a 'vibe'? I’m not sure if this is just a South Melbourne problem, but every time we miss golden opportunities, and are not already in the lead, its feel like the score is being undermined. It may be 0-0 on the scoresheet, but for me we are actually losing. Is it possible that such a mindset had become prevalent in the players themselves? 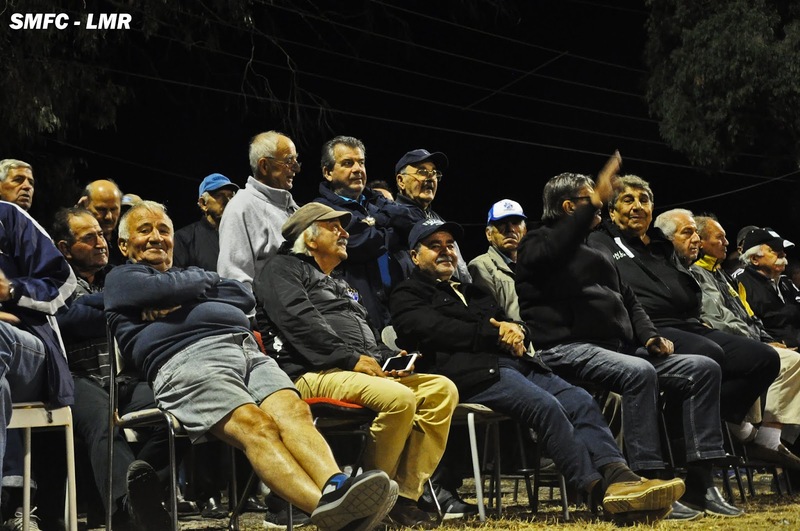 Maybe those of us outside the inner sanctum can only clutch at straws, like Tanga disappearing - as Kolman did - from club media duties, leaving it to the players to front the supporters. Tanga's replacement is assistant coach Esteban Quintas, who has little senior coaching experience; just the one game in charge of Bendigo City back in 2016. Naturally quite a few people think we're doomed now, and I wish I could find reassuring words to allay those concerns, but I'm stumped. All we can do is support the team and hope that things improve from here on. Patience is wearing thin. The initial goodwill on offer is diminishing. Memories of the good (or at least better) performances from earlier in the season are receding into the distance. Everything feels increasingly toxic. Photo: Luke Radziminksi. Which is not to say that yesterday was a complete disaster on the field. We didn't lose the game. 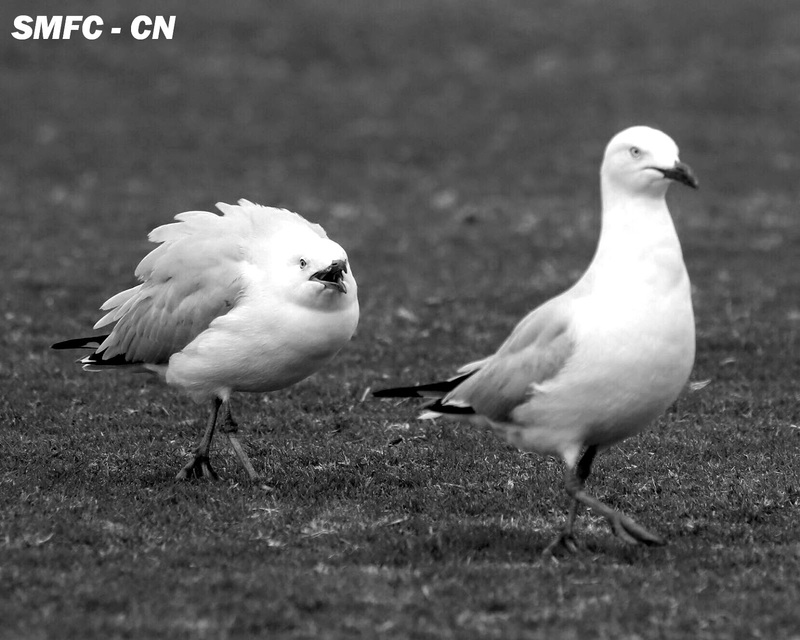 The performance was good in moments, and erratic in others. There were long stretches of the game, especially in the first half, where we dominated play, but our defensive frailties came to the fore again, and basically the first chance that Gully had, they scored from. Most disappointingly, the goal we conceded came straight up the middle, where I assume we're meant to have two defensive midfielders to provide cover for our central defenders. At least we got the goal back very quickly, which calmed down the nerves of the supporters for a few minutes. Krousouratis, who had an energetic but ultimately unfulfilling performance, at least tested out ex-South keeper Jerrad Tyson on this occasions to the extent that he parried the ball to Gerrie Sylaidos, whose patience with the shot seemed to stop time itself. Thank goodness he scored. There was no Kristian Konstantinidis, who having apparently recovered from the flu (assuming that was the cause of his absence last week), was out this week because he was recovering from an ingrown toenail. One wonders what affliction - real or imagined - will keep him out of next week's game. There was no Billy Konstantinidis, who looks like he'll have to wear a five game suspension, unless of course the club finds success at an appeal or tribunal hearing on the matter. But assuming the penalty won't be lessened, that's one game down and four to go, including the cup game later this month. The wind and rain and cold has finally arrived. Hello winter football. Pep Marafioti, who I have advocated as the most appealing stop gap option for striker, worked hard, was often starved of timely and/or appropriate supply, made some poor runs, and had two chances on goal from which he should have scored at least one. I'm thinking particularly here of the chance in the first half, where was probably offside (uncalled) and had plenty of time to choose a side instead of waiting to be shut down by his opponent. I continue to struggle in understanding the team setup and the substitution decisions. What's most concerning is that I can't help but wonder if the players think the same way, too. It's quite possible Tangalakis has lost the playing group, or at least veteran elements of it. At Kingston, KK was apparently shouting at him about defensive issues; at Pascoe Vale, Schroen was unhappy about Gerrie being benched; and yesterday Minopoulos shrugged his shoulders and shook his head when Gerrie was subbed off. You have one proven game-breaker, the kind of player a lot of other clubs would love to have on their books, and yet the level of trust or estimation that Tanga has for Gerrie seems far below what many pundits and even more South supporters have. We're not in the relegation zone, but we're in a relegation battle. Lot of talk going around that he's been sacked, but I'm waiting for the club to make the announcement, and not just because it's still April 1st. 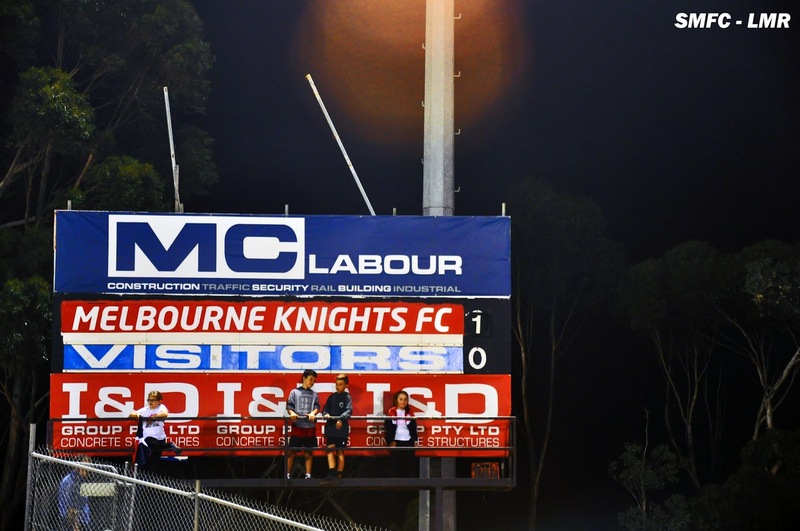 Melbourne Knights away on Friday night. Keep in mind that this match kicks off at 7:45PM, and that there is no curtain raiser. Saturday provided many options, one of which was to go to the senior women's game against Box Hill United at Wembley Park. Checked the PTV site, bus replacements from Camberwell to Ringwood. No thanks. Chucked it on the old YouTube instead, and saw something I hadn't seem from our women's team this season - a team that was switched on from the start. Raced away to a 2-0 start, and the coughed up a goal to be only 2-1 up. The final margin was eventually 4-2 our way, the same as the week before, but this was the best we'd looked in a while. Not a patch on what we were doing last year, and you have to wonder how far we are behind Calder, but it's a long season, and as long we can get to the finals - which we should be able to do pretty easily - we should be able to do something. Having decided not to go out to Box Hill South, I went out to Ardeer instead for Westgate vs Altona East. So many regrets, not so much for the game which went predictably the way of Westgate (3-0). Westgate have this habit of playing games at 6pm on Saturday nights, which always end up being freezing. Never mind the lights, which are poor, I've been to plenty of games in the cold, but Westgate's home night games are uniformly unpleasant when it comes to the climate. I'd always wondered what the appeal of playing the games at that time was, and all I can think of is that they're trying to get as close to a Balkan mountain village idea of cold. Speaking of the Balkans, some mob called Balkan Grill has taken over the Westgate canteen, and I had to do a double take when I saw someone cooking who was wearing a chef's style white coat; seeing a cevapi roll at $10 and every other option at least $3 more than was a bit of a concern. This is the club that prides itself in being mean street working class - they even call their ground 'The Ghetto', stupid name as that may be. Has the gentrification of Sunshine accelerated that quickly? At least we kept our non-Northcote undefeated run at John Cain Memorial Park going. Small mercies. This information is ripped straight from the club's newsletter. For those members and supporters attending the Sunday fixture against Green Gully at John Cain Memorial Park, please note access to the ground is restricted as a result of Council works. Ground access is ONLY available from the north via Clarendon Street. It is not possible to access the venue from the traditional car park area at the centre of the complex. That was incredibly deflating. I want to be optimistic because of the fact that, apart from the two heinous errors committed by Alastair Bray and Billy Konstantinidis, we played well, and created enough chances to score and earn a draw. But the other part of me agrees with Leigh Minopoulos' post-match comments, that playing well and not getting any points is, erm, pointless. So this could go one of two ways - we could continue playing well and have our luck change, or we could start playing objectively poor football and find ourselves getting humiliated. No KK, who was sick, and no Roganovic who was also sick, certainly didn't help matters. KK's absence meant that everyone's favourite whipping boy Perry Lambropoulos (who I am told is not Con Tangalakis' godson) got a start, as did the under-prepared Alastair Bray. Bray's first touch was fine, a long clearing kick, except for the fact that it looked like he'd hurt himself in the process. Worse was to come, when he passed the ball straight to ex-South man Dimi Hatzimouratis for an easy finish and the first goal scored by Pascoe Vale this year that wasn't credited to Davey van 't Schip. Then just as we starting to look like we might get back in the game - and it was still very early on - Billy Konstantinidis, who must've been responding to some very harsh treatment from the defender next to him, decide to punch said opponent in the guts. It made a hell of a sound, and the crumpled player on the ground pretty much made it a dead give away that something bad had happened, and Billy got his marching orders. Because it's also on video, it looks like Billy will be on the sideline for some weeks, if not months to come. Which is a terrible shame for someone who was going to be one of the two most important players in our efforts to be competitive this year. I would've thought that being a pro for over a decade in Greece that Billy would have copped worse, but who knows. Certainly not I, who has never been in a similar kind of position like ever, except for this one time at Greek school back in the 90s, but that's another story. The rest of the half saw Paco sit back - and while we tried to attack, there had not been time to properly reshuffle and thus Marcus Schroen was playing both midfield and centre forward, which wasn't working of anyone. Still, as unquestionable as Billy's send off was, I can't believe that Davey van 't Schip didn't get the same punishment for a swinging elbow, let alone how Gerrie being fouled from behind after he beat two or three opponents didn't warrant anything except a play on call. Oh, and apparently you can push down on an opponent's shoulders from a corner now. Good to know. The second half was better was from us, and it was hard to tell whether Paco were content to sit back or actually scared of what we were capable of, but we didn't have our shooting boots on. Three games in a row with no goals suggests to me that we need to send out a more attacking team. Taking Gerrie Sylaidos off when you're chasing a game doesn't seem to fit in with that equation though. Leigh Minopoulos, coming back from injury again, got about fifteen minutes, but clearly has a ways to go before being match fit. The closest we got was a shot cleared off the line, but it was only a matter of time before Paco got out the back and finally put the game to rest. Three losses in a row, a still unsettled and imperfect line up, and you wonder if it's going to get worse before it gets better. Green Gully at 'home', at John Cain Memorial Park. In 27 games here, we've only lost four times, all to Northcote. Not that a stat like that means anything. Our fourth round match against Essendon Royals has been scheduled for the Good Friday public holiday next month, with Lakeside as the venue. Thanks to Luke Patitsas of the Sour Grapes South blog for sending over one more match program, from the 2015 grand final. We've also added a couple more from Mark Boric from the 2002/03 season, the Wollongong and Newcastle home programs - and we'll add a Carlton away program from 1999/2000 tomorrow when I can do add text recognition to it, As usual, you can find the new additions with the old, on the South match programs page. get too arty for their own good and take a pic of said in table in black and white! Got to see two South women's games this week; well most of them anyway. The first game was a midweek affair against Alamein out at the Knox synthetics. This was an ugly, ugly game to watch. South coughed up the early lead and had to wait until very late to claw back the game - and only via a semi-dodgy penalty. Good on Sofia Sakalis for smashing in an unstoppable shot from the spot. Imagine what player - still only 17 - could achieve if only she lost a bit of hell tunnel vision when she has the ball. Then onto to a Saturday night game in Geelong against the Galaxy, who are now playing out of Stead Park and wearing the colours of Geelong SC - they've got to do what works and keeps them as a going concern I suppose, and playing out of Torquay the past few seasons seems to have been a sort of dead end. Once again, a pretty ugly game, and worse, this time the side fell 2-0 behind before halftime. I honestly don't know about this team this season. We're always a little bit of a slow starting team until the W-League players return, but it feels like there's been a slip in standards. To be fair, one commentator on soccer-forum whose opinions on these matters I respect has suggested that the standard across the board has slipped a bit. Certainly I think not having Melina Ayers not the retired (to social football) Tiff Eliadis has taken away something from the team. Still, diminished or not, the team found a way back from the brink in this game, eventually steamrolling past the home team to 4-2. Almost every one of the four goals had a bit of luck or chaos to it, but it's not how, but how many right? Just ask the senior men's team about style over substance. Here's the thing about actually attending a game in person. Unless the game is like, just around the corner from your house, getting up and leaving halfway through the match is usually not worth the bother, because the time and effort and money (for those that pay entry) expended in getting there means it probably isn't worth getting up and going home after 35 minutes of awful football. Which is to say, that I have been spoilt by the five weeks or so of non-stop live streamed games. But someone will make an argument about fresh air, sociability, and souvs, and I suppose you have to test that theory out as well. Well out at Paisley Park the air is always refinery fresh, the sociability is limited to the same two or three sane people you'd find at any ground, and the souv, being a round one 2019 offering, was of course put into a round 22 2018 roll. The game between Altona East and Mill Park, who I'm already predicting to be among the mid-table also rans - and this is me, who never makes predictions like these. Anyway, this was a lousy game for 40 odd minutes, and then picked up thanks to a red card to East and a converted penalty to Mill Park. The game opened up in the second half. East butchered some chances, drew level from a corner, Mill Park missed a penalty, and then Jerry Karpeh - remember him? - hit one of the worst penalties I've ever seen, and East failed to take the lead, which naturally led to the visitors scoring two late ones for a 3-1 win. I'll probably be back. It's a decent walk from Westall station to the The Grange, and a decent walk back after a game, but two things can make the effort seem more worthwhile. First, a win; and second, a decent souv. Sadly neither of these things was on offer on Monday night, and we have to make do with the hand we've been dealt. It's not the result we wanted, and for a good chunk of the game, not the kind of performance we wanted either. The portents were there from before the game, when we saw that once again Gerrie Sylaidos was on the bench. Starting on the bench against Avondale, I can understand even if not entirely agree, but why he didn't start on Monday is anyone's guess. More to the point, why was Gerrie not subbed on until about ten minutes after Kingston got their red card? And why was Luke Adams not even in the starting eleven? And why was Perry Lambropoulos still starting at right-back? These are the questions that I and many other South fans had on Monday night and afterward. The consensus among our social media dwelling fans seems to be pretty clear. It starts with a back four of KK, Adams, Marshall, and Norton. And just as importantly, starting Gerrie in the same team as Schroen, and dropping one of the two defensive mids we've been starting every game with. The VIP section at any ground is wherever Mike Mandalis is located. If Tangalakis is of the idea that Gerrie and Schroen can't play in the same team, surely that notion would've been dismantled once and for all by the way the team played in the 25 odd minutes they were on the park together. Yes they were playing against ten men, but the team as a whole showed more purpose and drive than it had prior to that point. It's understandable that in some games, against a superior opponent, a coach might want to go more defensive, try to grind out a result. This makes even more sense I suppose when you don't start a recognised striker in a game for seeming lack of other options. No amount of voodoo stick magic was able to get us over the line. The other side of this apparent desire to preference defence over attack is this - our strengths this season, such as they are, lie not in defense, but in our attacking prowess. Sylaidos, Marafioti, and Krousoratis are dynamic, creative players who thrive on being given licence to attack. Marcus Schroen is capable of scoring goals, even if he didn't make the most of either of his two headed chances in this game. And now that we have Billy Konstantinidis starting, surely our efforts should go on to maximising that threat. Indeed the biggest positive to take from this game, other than the fact that we did fight out the game to the end without too many obvious signs of despair, was Billy's performance. He straightens the team up, provides an obvious focal point, and has a powerful shot. But most importantly, he showed on Monday night that he can also be a hard worker. Numerous times in the latter part of the game, he would move out of the box to provide an option, to collect a pass, to create room in the space left behind for other players to move into. This dog is every South fan at the moment. There was a lot of resignation among our supporters after the game, and to a degree it was warranted. But I felt that when we actually started playing the way we are capable of, we are actually a very threatening side. The key seems to me to settle on a starting eleven that takes advantage of our strengths. That doesn't negate our deficiencies - we are too reliant on counter-attack, we play the ball back to much, Roganovic's distribution is in poor shape, etc, etc - but I was more upset at the beginning of the game than I was at the end. That's not to say I was happy with the result, only that one has to acknowledge that the team fought until the end, created its share of chances, and played against a keeper that had a very good game. As long as morale remains steady, and the right team setup is put on the field, more positive results shouldn't necessarily be far away. There's a lot of ifs and buts in that, and if we lose another two or three games soon and find ourselves in the relegation zone rather than hovering above it, all pretense of stoicism will fall away. I hope that it doesn't come to that, because this team has the potential to do good things. Pascoe Vale away at CB Smith Reserve on Friday night. Kinda weird watching Dandenong City vs Melbourne Knights, this year's variant of the NPL Croatian derby, in that while making references to the FFA Cup match these teams played against each other a year or two back, neither commentator seemed to make reference to the promotion-relegation playoff match they had in 2017, and which one associate of mine who used to work on local building sites said would be fixed in favour of Knights. Now that that result just happened to fall Knights' way proves nothing, but the game itself could've been a momentous occasion, and I wish it'd be treated as such. 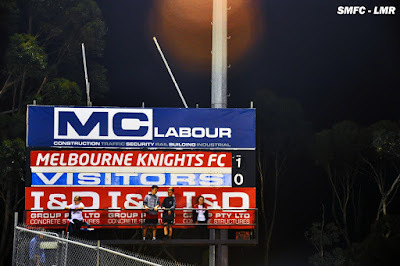 Far less momentous was this game, which never reached any great heights, and which Melbourne Knights won comfortably. So over on to another of the live streamed games, Port Melbourne vs Green Gully, at Green Gully Reserve for reasons I do not know. I tried to come up with all sorts of possible reasons, but nothing worth putting to print. It looks like there are even fewer people at the game than either a normal Port or Gully home game, which makes sense. Port is 1-0 down at their home-away-from-home, thanks to a Michael Eagar mistake, and they are soon down 2-0 thanks to Eags again. You can't win them all. On Saturday, I checked into Avondale vs Pascoe Vale, a pretty ordinary game that was only ever going to have one winner, in part because Davey van 't Schip is being expected to score all of Paco's goals this year; that is, until this Friday one assumes, when Joey Youssef will score his trademark goal against us. Switching over to the Geelong derby between North Geelong and Geelong. I was promised fireworks and atmosphere the likes of which we scarcely see at this level. Instead we got an awful game, and an audio feed where one had to trust the commentary team that the local Cros were making a lot of noise. At least there was some action eventually, with North taking the lead, and quickly rushing out to a 3-0 lead with the visitors looking totally unlike scoring except for the one time they did, and thus at halftime of this game I switched over to the main event, hoping for no regrets and expecting none. Altona Magic vs Oakleigh Cannons provided its own moment enlightenment. Now when Chris Taylor was coaching, we were often winning. Sometimes it looked great, sometimes far less so, but even when it didn't, the ends justified the means. But now that CT is at Oaks, along with a variety of former South players of a recent vintage, the style of play is currently borderline unwatchable; I say borderline, because I have been watching them with some regularity this year, but the whole thing has the moral stench of a snuff film. I'm entertained, but I also feel unclean after the experience, like I should be wearing a raincoat and dark shades while entering the theatre via shady back lane entrance. In previous weeks there was the just the idea that Oaks was struggling, perhaps being a touch unlucky, that result would eventually turnaround. And maybe they will. But last week the on-field arguments and abuse towards teammates started, and I felt like I was back in 2018, as people who should've known better chewed each other out and contributed to our own dire situation. And if our own potential 2019 dire situation is not completely unrelated to what happened last year, neither is Oaks situation that far removed. If one was to choose an allegory from Greek mythology, I would choose the well-known fable of Collingwood sacking Mick Malthouse and Carlton rushing in thinking to may hay of that famous ray of sunshine. It didn't work for the Blues, and it's not working yet for Oaks, but it's early days yet. Still, they'd like to get some more points on the board before they're due to beat us in a few weeks. Live streaming these first few weeks has been a hell of an experience, but all of sudden I feel like I've not really enjoyed much of it; like there has been too much choice and no chance to savour the delights of a singular meal. Hopefully the start of the unstreamed state leagues will get me out of the house and at the grounds a bit more. At least I got some fresh air and exercise I suppose. For those that missed the round four draw earlier today, we were drawn at home against Essendon Royals. The Royals are currently in State League 1 North-West. From what I can gather, they are not considered among the front-runners for that competition, which is predicted by armchair pundits as being a two-horse race between Preston and North Sunshine. Nevertheless, you wouldn't want to take any opponent lightly, would you? 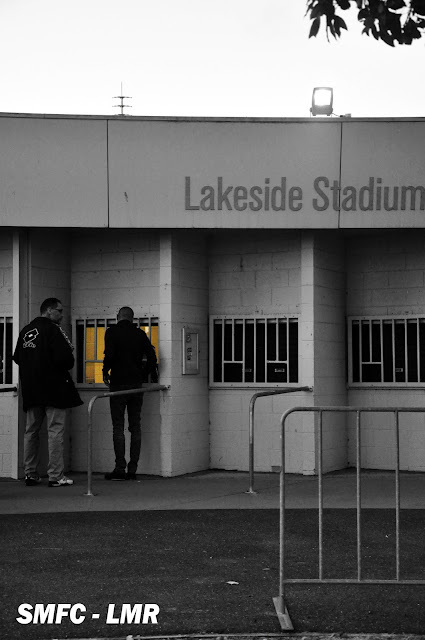 No idea on venue and date yet, but I assume from looking at Football Victoria's calendar that it'll be a mid-April game at Lakeside. We're apparently playing a friendly tonight against Malvern City at Warner Reserve in Springvale. Kickoff 7pm. I guess Tanga wants to get some more run in the legs for some players? Outside of A-League teams playing pre-season matches against NPL teams, in-season friendlies for NPL sides is an unusual thing, but not unheard of - though the last time I can recall us playing in one was all the way back in 2008 when we played such a game against Northcote. There might have been another one against Altona Magic one year as well, but who can remember all the details? On the one hand, this is the kind of result that was on the cards on a number of fronts. First, because Avondale is a pretty good team, one of the best in this competition, and we are at best in the very early stages of trying to build a team that can reach that level. Second, because we are new and young team, there are going to be games where we get flattened. Third, because we were pretty ordinary through large chunks of the win against Port the other week. Such was Saturday's game, where we fell behind early, pulled our finger out for about twenty minutes after that, but having failed to take advantage of the two or three half-chances that we had, proceeded to fall apart at an alarming rate. Roganovic standing flat-footed for the second goal was almost as alarming as the fact that Stefan Zinni's goal was the third match in a row he'd scored against us since leaving us, putting him in the Joseph Youssef class of ex-players doing us over. And it's not like we weren't trying - we were - but we just weren't good enough on the ball, off the ball, and even just in general fitness which is a really big concern. Getting sucked into fights in the tunnel doesn't help either, and not starting Sylaidos seemed to backfire, because by the time he did get brought on the game was already cooked. For all of Schroen's heroics against Port, he wasn't much chop against Avondale, but I suppose in a losing cause it was good to at least get some run in his legs. Playing two defensive mids looks like a dead-end tactic once we fall behind, and so either Gage or Bereveskos is probably to going have to make way for Schroen as a full-time mid. George Howard continues to work hard as a makeshift forward, but it's not working. You'd be better off playing Pep Marafioti as a forward or even Manny Aguek, who'd all be killing time until Builly Konstantinidis gets fit enough. Now seeing as how we all probably had the Bentleigh game and this one as losses before the season started, and that there's little to be gained from trawling through that muck, we may as well pad out the rest of this piece by talking about what an awful experience everything outside the result itself was on Saturday. Considering there was some sort of signage at the Reggio Calabria last year about how Avondale were going to build some sort of stand, I was disappointed not to see anything even started. Not that I expected them to have finished, but here we were on a warm day, and almost zero shelter for spectators. The limited shelter choices were a small tarp canopy, a small and rapidly diminishing patch of shade in the south-east corner of the stadium, and some shaded area in the shadow of the Reggio Calabria Club. Oh, and I suppose the Reggio Calabria Club itself, assuming they would let guests sit on their balcony on a match day without a two or three drink minimum. Speaking of drinks, Avondale had three alcoholic drinks on tap; a cider, a Belgian pale ale, and their own signature beer, something called 'Avenger Ale'. The bloke working the bar at least had the honesty to admit that the Avenger Ale was actually just the pale ale under a different name, just in case an opposition supporter didn't feel comfortable ordering it. No word on whether the cider also came from the same tap. As for opposition supporters, well this week that would be us, but going off the live streams and highlights packages of Avondale games, I'm not sure that'd be such a problem most weeks. One bike-riding #sokkahtwitter identity who was there as a neutral openly speculated that 90% of the crowd was South fans; an observation which, as I noted to him at the time, would be no surprise to any South fan who has spent any time following the club in this competition. That's not to cast aspersions on the validity of a team like Avondale or Bentleigh or Hume and their two men a dog supporter bases being in this competition and having success despite the low turnouts. 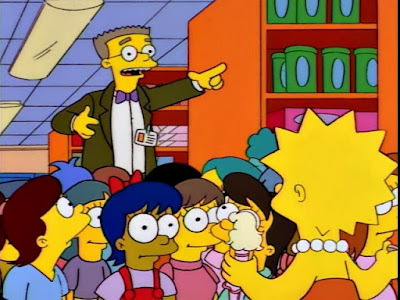 And anyone who is a supporter of the meritocracy of promotion-relegation, as I famously am, must allow for teams who have earned their way up the league pyramid by winning championship or being promoted through conventional means to enjoy the fruits of their labour. And we must also make the allowance that income from crowds is not even close to being the main income source for any club at this level and that, if anything, actually having supporters in this league is a liability, not just for the mischief they might get up to that could cost you points and fines, but also just their rank, desperate neediness. That absence of fans does mean that vocal and visual support has to come from somewhere else, and that means the only people left to do it at supporter-less clubs are either committee members of the players and coaching staff themselves. And when players decide to take that mantle upon themselves, it usually just ends up in them being outrageously and tastelessly obnoxious to their opponents or opposition supporters, as was the case on Saturday. You're up 4-0 against what is at best a middling team, and you still want to act like knobs? That's the nature of life choices I suppose, and you can choose to please yourself first I guess. There were plaudits for the general good humour of Chris Oldfield in goal in dealing with the supporters behind his end, but my riposte to that is it's easy to be good humoured and genial when you're up 4-0. Monday night away to Kingston City. Why would you even want to leave the house anymore? Now that every NPL Victoria game is streamed live, why would you dare risk the demonstrating the ignominy of your status as a dateless wonder to all and sundry by actually leaving the house and attending an NPL game? Stay home instead, keep the gate money, avoid the stadium music, drink your own beer, eat your own food. It's like having a cut-rate pay tv subscription. And really, what would you miss from attending? The c-grade surliness of the security guards? Overhearing the ressies - those few that have stayed back after their game to watch the seniors - talking about chick on Tinder? The inane ranting of the competing coaches, which carries across the whole stadium (and I use that term loosely), because there's no crowd or competing atmosphere to drown it out? The last of these you can still get on the stream anyway of the coaches are near the broadcast side, if you're still one of those people who is entertained by that kind of carry-on. For the rest of us, we can just sit at home, flick between whatever game happens to take our fancy, or just ignore them all and do something else. Where I would normally have gone out to Knights Stadium even though it's less fun now that Knights look like a competitive side again, I got home late from some other business and watched the final ten minutes of the first half of their game against Bentleigh. Tyson Holmes coughed up a very poor turnover in his own half which led to Bentleigh falling behind. Soon enough it was halftime, and the opportunity presented itself to switch to the other game. Paco vs Port was irritating for the fact that there was no atmosphere except for the coaches yelling, and a game that was kinda meh. But at least when I turned it on it was still 0-0, and thus 'competitive' by default. Paco had more of the ball, more territory, more corners, but since they only have one avenue to goal and he was being triple teamed, nothing meaningful was being created on their front. Port looked ordinary, and struggled to get the ball for good portions of the first half, but still missed the best chance of the first half when their West Ham youth team striker who scored against us the week before missed an open goal. These things happen. At half-time of the Pace game, I switched back to the Knights game, where I saw Knights double their lead, at which point I switched it to something else because who wants to see Knights fans happy? Answer, no one. The Paco game resumed, they kept winning corners but did nothing with them, and eventually Port used slightly underhanded play - a short corner played to a substitute, who played it to the back post where an unmarked Michael Eagar received the ball in part because two Paco defender took each other out. But Eags' control and finish were class, and that pretty much decided the game. The next day after an overly greasy chicken katsu and rice dinner, on the train I watched only bits and pieces of Hume vs Heidelberg, and Dandy Thunder vs Magic. The next day I watch Nortchote vs Murray United until the former close out the game, and then the last five minutes of St Albans vs Moreland Zebras filmed from the opposite side to which they usually do, which is disorienting I have to tell you, and it must have affected Zebras too because they just stopped and spent the last five minutes giving the ball back to Dinamo who did the right thing and took advantage of that generosity. Was any of that as enjoyable as actually being at a game. We'll never know. Watching Kingston grind their way to a draw with Oakleigh doesn't fill me with confidence for next week, because they couldn't be that ordinary two weeks in a row. I can't tell you about the quality of the food at Avondale, because I stopped by the Vic Market and bought a weisswurst before the game, but Dave had some very strong opinions about one of the offerings at Avenger Park. Last time I posted one of these back in 2017, I said that it was the last one that I'd found on the Wayback Machine that was still in working order... but I was wrong! I've found another one, and bless, it's from someone who still goes to games! Buxton (home of the ‘Buxton Burger’). Actually, I live in South Clayton. Becoming the world’s greatest DJ and being the music editor of Lots Wife, the Monash Uni newspaper. Racing Genk, Torquay United, AEK Athens, Hamburg and Oubasi Goldfields and Border Security. But South Melbourne are the number one priority and interest. WHAT AGE DID YOU EXPERIENCE YOUR FIRST MATCH? Also, the World Club Championships was incredible too. Wish I went, but I went nuts at the TV. I’ll never forget the Vasco supporters before kick off against South. Amazing scenes. When we played Perth Glory at Lakeside on a Wednesday night. I forget which season, but it was a battle for top spot and we scored 2 goals in a couple of minutes to take the lead and finally win 2-1. A great night, and Jimoin the comedian was there going nuts for South!! Another favourite game was against Marconi at Middle Park years ago. No idea which season, but Tsolakis scored a penalty and Awaratife added a corker seconds later to seal an impossible victory. (The Clash of the Titans – Season 1992/93). BEST SOUTH MELBOURNE PLAYER EVER? I can only speak of who I have seen actually play and all I need to say is that there’s only one Paul Trimboli. 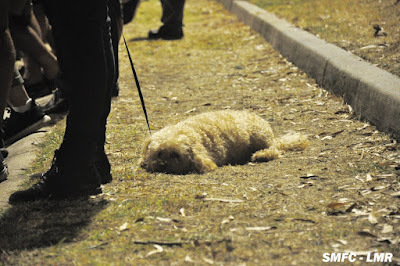 WHAT DO YOU LIKE ABOUT SOUTH MELBOURNE? There are too many things to list, but I like the way South caters for soccer fans in Melbourne and competes, I believe, quite well for the very competitive Melbourne sporting dollar. I think there are some great supporters doing great things for the club too. WHAT DO YOU DISLIKE ABOUT SOUTH MELBOURNE? I get annoyed at the way certain parties at South (both internal and external) cling to the Greek heritage of South. Sure the club has an ethnic history, and we should never forget that, but still referring to the team as ‘Hellas’, which means Greece, has been played for too long. I also dislike the seats opposite the grandstand. They encroach upon the remaining standing area too quickly for my liking. I hate sitting and watching the football. WOULD YOU EVER SUPPORT ANOTHER NSL TEAM? Coz South Melbourne are the pride of Victoria and the most famous Australian sporting club in the world! GO SOUTH!!! THANK YOU FOR YOUR TIME JAMES. I can't tell you about wet bulb temperatures, but I can tell you about when it is too hot to wear a pompom beanie, and Saturday afternoon/evening it was too hot to wear a pompom beanie. That in itself proves nothing, but it does make you think; if Port Melbourne has lights - and it does - why did they not change the kickoff time of this game to an hour or two later? Knowing well in advance that the temperature was going to be very hot, I am told that during the week South suggested to Port that the game be pushed back an hour or two, only for Port to refuse the request. I cannot understand why, if not for the comfort of the spectators, than at least for the comfort and safety of the players, especially the under 20s who would have to cop the brunt of the heat. And goodness knows what was going on with the thinking out at Keilor, where the women's teams were playing even earlier in the day, and two players from the under 19s game collapsed during the match. This in a week where the Tasmanian soccer authorities pre-emptively postponed a triple header at KGV Park on the opening week of their season, because of anticipated extreme weather conditions. That the worst of the heat had fallen away by about 7:00pm - or half-time of the senior game - only served to further emphasise the fact that the senior game and its curtain raiser could have been pushed back an hour or two and we'd all have been the better for it. Anyway, enough complaining about irrational approaches to dealing with playing in predictably hot conditions. An unchanged starting line-up, with the only change being Alastair Bray listed on the bench. The game started off with the teams swapping ends after the pleasantries were done, catching the crew behind the Plummer Street goals out, and necessitating a trip to the Williamstown Road end of the ground. But which way to travel? 30-40 people going en masse through the pavilion side of the ground doesn't seem convenient. Going around the back of the pavilion means we'll miss a ton of action. So, on through the famed forbidden zone we go, which just goes to show the insanity of the forbidden zone, because all you to prevent anyone coming into the area was a security guard, Port Melbourne Jesus, and a couple of pieces of string. Anyway, we eventually camped at our attacking end, trying to find what little shade there was, as well as trying to see through two or three nets. From what I could tell, we were doing pretty in the first 25 minutes or so. We even got a goal, with Pep Marafioti finishing off some good work by Brad Norton and Nick Krousouratis. Then when the second half started, we just disappeared. There was no midfield. Every clearance up the field was just walked back by Port. There was no player of ours seemingly able to take control of the game, or adjust the tempo, or even properly waste time. The goal which would see us fall behind seemed inevitable, and all that was keeping us in the game was Nikola Roganovic and Port's sloppy finishing. But as good as Roganovic was in terms of keeping the scores level, his distribution often invited Port to launch another attack with us having barely touched the ball. Another thing which compounded the problem was that we looked gassed earlier than usual. We haven't exactly looked like the fittest team early on in the season, but the heat compounded the issue on Saturday. Taking Gerrie Sylaidos off was a good decision. He was struggling even when we had our ascendancy early on, and Marcus Schroen's introduction at least offered fresh legs, a bigger body, and the kind of player who specialises on turning games on their head. A couple of other changes - Lamproboulos off Konstantinidis, and Howard off for the other Konstantinidis - also helped, not just because of the fresher legs, but because the team looked closer to full strength. What our eventually proper, fully-fit starting eleven looks like still remains a mystery. We managed to slowly work our way back into the game, with Krousouratis having a rocket of shot hit the bar, but still it was almost out of nowhere that we got what would be the winning goal. Our corner was cleared, poorly, and Norton began the process of recycling the ball into an attacking area with a terrible, tired, shin-height pass to Schroen, Schroen passed it back to Norton, and Norton put in a great cross to SS Anderson Reserve goalscoring specialist Luke Adams who controlled the ball on his chest then volleyed it home. Then the sickness of waiting for the goal that we see us fall behind turned into the sickness of waiting to see the goal that would turn our three points into one. But it, too, never came, and we somehow came away with our second win of the season. A bit like last week, we didn't play our best, but we got the points. We played better against Bentleigh, and got squat from that game. Two weeks in a row, the goal comes from a poorly cleared corner. It's not exactly thrilling build up play, but bread and butter stuff is just as good. And there have been moments where the side looks like it can thrill as well as do the simple stuff. Right now though every win - especially against teams around about our level - counts for double. And in a season which is as much about rebuilding a shattered playing and club culture as it is about surviving and hopefully thriving, every point we earn now is one less we have to scrounge out later on. Avondale away at the Reggio Calabria Club on Saturday afternoon. Friday night was spent on the couch, with the option of three games. These were the "one of the these teams has to wear their away strip" derby, the ongoing saga of "will someone other than Davey van 't Schip score for Pascoe Vale", and "let's see how many ex-South players can fit into the Oakleigh Cannons clown car". I decided to go with the last of these, and spotted the following at various times on the night: Milos Lujic, Nick Epifano, Matthew Foschini, Luke Pavlou, legacy characters like Ramazan Tavsancioglu and Tom Matthews, as well Goran Zoric making an appearance off the bench, and Rory Brian listed as substitute keeper. One also can't help but think that not being able to get Matt Millar, that Oakleigh settled on one of the brothers leftover in the Millar family mini-van. Of course the other point of interest was seeing if Oakleigh could somehow fail to pick up a win, giving them three losses to start the season. It seemed unlikely, what with the quality Oakleigh has at its disposal, but half an hour in and Oaks were 3-0 down, even with Thunder missing a penalty due to the unbridled greed of Peter Skapetis. It wasn't that Oaks were that bad - the ball could have fallen their way on a few occasions, but didn't - it was how familiar some of the deficiencies in their play looked: the exaggerated slacker vibe of Lujic, the sometimes clumsy defensive midfield play of Foschini, and Epifano still trying to recreate that goal against the Knights from the 2015 FFA Cup. To be fair to the last of these three players, his efforts in the second half were the main reason Oakleigh even got close to getting back in this game - that, and Milos getting benched - but it was a bit like the Kingston-Thunder game from a few days earlier, with one side being (mostly) ruthlessly efficient in front of goal, and the other squandering opportunities at will. So Oaks remain pointless, which is not a situation I expect to last long, but which for the time being does provide its own degree of prurient interest. It's meant to be a winter sport, so can winter hurry up and get here already? 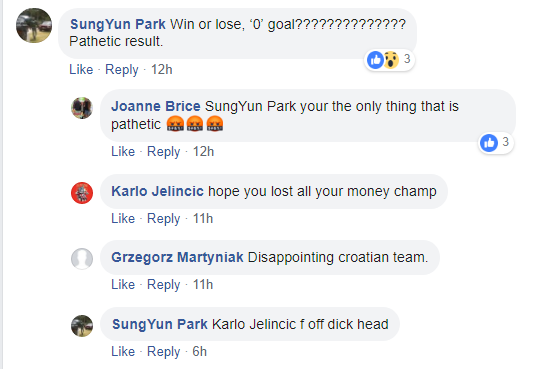 Someone not familiar with soccer might think it strange how one goal can make all the difference between throwing the club into the emotional abyss or writing off a match with the cliché "not a great performance, but it was good to grind out a win and on to the next game". Such people may also find it strange how creating three or four clearcut chances and failing to take any of them means less when someone scores off a half chance, slotting a ball through traffic from the edge of the box. Before that, most of what we had was increasing frustration and the fear that we would cop a goal on the counter. Dandy City came to Lakeside with a plan, and that plan was to sit back and try and hit us on the break. It was in stark contrast to last week's game against Bentleigh, where the Greens sought to take the game on, and we were able to attack promisingly on the counter in the spaces left behind by the Greens' aggression. In contrast, last Friday we were thrust into the role of the more active team, and the evidence was that we still have some work to do on that front. On the one hand, I suppose we should be flattered that an opponent thought enough of our potential to try and curtail our attacking threat in this way. On the other hand, you wonder if other teams will also employ this tactic, hoping - possibly correctly - that we aren't as effective when we're asked to dictate play with the ball. Most of what we were able to produce in the first half came through the work of Gerrie Sylaidos, who in lieu of adequate connections in midfield, worked cross-field passes to the right-hand side where Nick Krousouratis was operating. This combination - although not the precise tactic - led to our best chance of the game, with a Sylaidos pass opening up the City defence for Krousouratis' shot which somehow hit the post and come straight back out. I thought it had gone in, and so did a good chunk of the home crowd, but it was not so. When added to makeshift centre-forward George Howard's shot straight at the opposition goalkeeper (who was not Chris Maynard, as some in the crowd believed) early in the game, there was palpable frustration in the crowd, mixed with wanting to show patience with the young squad. The red card to City's James Kelly for an off-the-ball attack on Dean Bereveskos only served to solidify the tactical trajectory of the game. And as the game wore on, it seemed to be heading for one of two outcomes; a tepid 0-0 draw, or a loss to us courtesy of a goal pinched by the visitors. They sent in some dangerous balls across the box, but their only real chance came from a Dean Piemonte strike from the edge of the area - the kind of sucker-punch that Piemonte specialises in, not least against us - which sailed high and wide. Otherwise our defence held up reasonably well, and much praise has been sent in the direction of Luke Adams and Jake Marshall, who did enough good work to see that Nikola Roganovic didn't have to make a save all night. But further up the field things were less cohesive, and the end result perhaps meant that what looked like a team afraid or unsure of how to take the game on against a conservative opponent, can be construed as - for now - a team playing patiently and to instruction. For example, I'm not sure what George Howard's natural position is, but it ain't centre-forward. Pep Marafioti struggled against Steven Topalovic out wide, but I would have preferred Pep at centre-forward rather than Howard, because at least Pep has a striker's instincts, as shown by his flick-on attempt on from a low Sylaidos cross - an attempt which would have broken the deadlock if not for a superb reflex save by Kennedy in the Dandy City goal. We did eventually get the lead thanks to Sylaidos' shimmy and toe-poke from the edge of the box through a maze of bodies, and it was not an undeserved lead. The rest was about holding on, and seeing a glimpse of what prize recruit Billy Konstantinidis can do. Though helped by the fact that the now trailing Dandy City had to come out and get a goal, Konstantinidis' mere presence was that of an old-fashioned footy full-forward, someone who immediately straightens up a side and gives it a sense of directional clarity. We played better the week before, and came away with nothing but a small replenishment of the pride and belief we threw away last year. We played not so well on Friday night, but came away with three points and the knowledge that we can win when playing less than thrilling or inspired football. Now what would you rather have? Port Melbourne away on Saturday night, beginning our customary stretch of early season away matches. It's another one of hose theoretical must-win matches. Port are currently on one point from two games, haven't scored yet this season, and yet are also probably not quite as bad as that form-line suggests. According to the Bureau of Meteorology, Saturday is set to be a scorcher - 38 degrees - so hopefully it gets a bit cooler by kickoff time. Pity for the under 20s though. Remember to be sun smart this week. There was no minute's silence for the passing of Brian Edgley last week. Granted, Edgley was only our coach for about two thirds of the 1976 season - and his legacy at other clubs like Mooroolbark, Preston, and Balgownie Rangers was much more substantial - but it seems remiss not to have at least paid some tribute to him. The game started ten minutes late for who knows what reason, which is not a great thing when Friday night games already start so late. I suppose it worked in favour of the habitually late. Food service in the social club was slow. Since we have seen it happen with every operator of the social club's kitchen since the social club re-opened in 2017, one must assume that the kitchen is ill-designed for match day operations as opposed to normal bistro operations. Here's hoping that it's just teething issues with the new operator, and that when the glut of home games arrives later in the year that these issues are ameliorated to a degree. I can understand waiting for things like burgers and steak sandwiches, but having to wait for things like dim sims and potato cakes, which should in theory easily sit ready in a bain marie, is a worry. The menu has been simplified for match days, and most things seem to be of reasonable value. The burger I had was not nearly as good as the one I had at the members' night a few weeks ago, but one reader wanted me to note for the record that his steak sandwich was excellent. Away from the kitchen, there was new and old merch available, and the promise has been made of a variety of heritage themed merchandise becoming available during the year. People seemed to like the commemorative postcards which voting rights members received, though I almost can't bear to look at them because of the rampant superfluous apostrophes. One member who did like the postcards was moderately disappointed that the cards were double-sided, as that meant that he couldn't frame any of them without needing to get another set of cards. There did still seem to be some problems with people not being on the database despite having paid for their memberships. On the plus side, the bloke who complimented the quality of the steak sandwich also wanted me to note that the sturdy reusable sealed plastic bags were a nice touch. It wasn't in the membership brochure, but I'm still shattered. Junior Soccer Federation. Photo: Paul Mavroudis. The South Melbourne women kicked off their 2019 campaign last week against Southern United at Monterey Reserve. Normally I wouldn't dare head out that far for anything other than a South senior men's game, but the senior women play away from Lakeside in the early part of the season for as long as the men do, and every time they play at Keilor - the only away NPLW venue close to me - there's always some damn clash with the men's team or some other event. "where is the amenity in delivering all-day ten minute train frequencies if adjacent bus routes only operate at hourly intervals?" Southern United are a struggling outfit who were reputedly close to folding last year, but they've sorted themselves out enough for another go in 2019. Their existence and struggles do seem to suggest that the late Tony Dunkerley's dream of composite representative franchise teams from the south-eastern suburbs and Mornington Peninsula are not as straightforward as he would have liked. Having smashed them 14-0 last season, it was no surprise that we ran out 11-0 winners here, even without several W-League players in the team, and notable absentees such as Tiff Eliadis who has retired. Southern struggled to even get the ball up the field; the only chance they had for the game was when a South defender hit a stray back pass to the keeper. So, no stress on this occasion, just a relaxed day out in Frankston North. Thanks to the Marafioti brothers, last week we got into a discussion in the comments section about player-family connections at South, and we came up with the following. But there must be more. So hit us up in the comments section for the obvious (and not so obvious) ones we've missed. We put out the call for more South Melbourne Hellas match programs, and Luke Patitsas (of the Sour Grapes blog, a South blog with someone who pays attention to the games) answered the call. 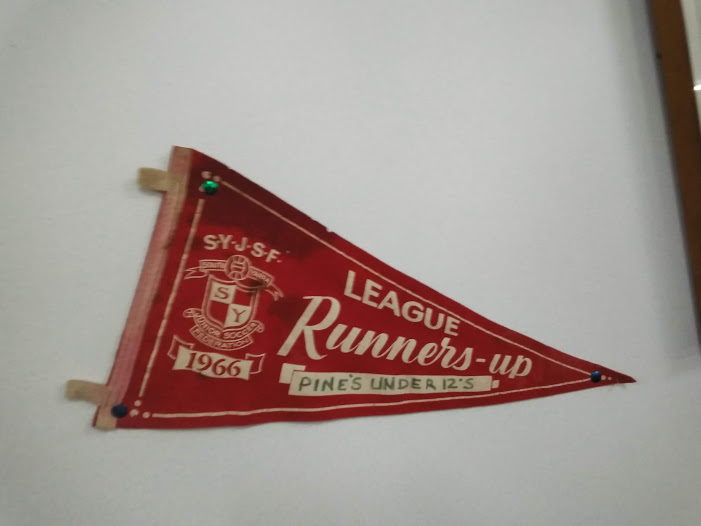 Thanks to Luke's efforts, we've been able to add one program from 1985 (Brunswick away); five home programs from 1987; a home program from 1989; two from 1989-90; one from 1990-91, a really great George Cross program; one from the opening day of the 1991-92 season; and two from home games (rounds 18 +20) from 2005. For these and every other program we've managed to source, check out our match programs section. And if you have something that South of the Border is missing - and I know that some of you do - please get in touch with me. FFA is doing a roadshow gathering people in cities across Australia to talk about the issues the game faces. They're in Melbourne on Thursday May 2nd, a training night, but if you'd like to go anyway, head to this link and register your interest. So this week FV announced it had entered into some sort of arrangement with some sort of group to broadcast - live - every NPL men's match, every NPL under 20s match, every NPL women's match, and a minimum of two NPL 2 games a week. Now having seen this kind of thing happen before, albeit on a much smaller scale - I'm thinking of circa the 2010 or 2011 seasons when some Harvey Silver related company filmed one live game a week - I was not in favour of this at all. I'm happy for highlights packages to be produced, and I'm happy for the odd radio game and full-blown live stream for important games - but this is too much. And surely the aim should be to get people to go to games? But then I remembered that whatever you do, no one's going to turn to up to any game after whenever someone decides summer's ended, so sure, why not stream every single game? And as Matthew Galea has noted, it will at least provide some sort of quantifiable data on the interest in NPL competitions for proponents (and opponents) of the second division and promotion-relegation debate to manipulate to their liking. 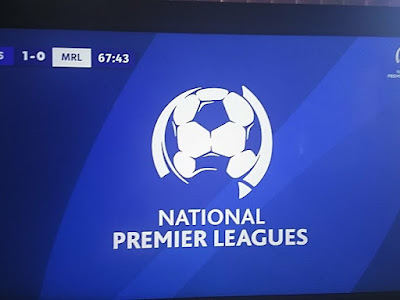 The NPL Victoria games are available on YouTube and Facebook, and the consensus seems to be that the video quality is better on the YouTube streams. The graphics are basic but mostly clean, and they're updated regularly with stats and promos for various Football Victoria events. There's no replays - yet - which means if you stop paying attention you have to scroll back on the video to see a goal again. They seem to occasionally have commentators, and occasionally not. By the way, if you're interested in doing commentary, analysis, etc for this, hit up Teo Pellizzeri with an expression of interest. I'd put my name down but I don't know the players and I can't see good and I don't even know anything about soccer; and while that's part of this blog's charm, it probably wouldn't translate to something requiring a certain degree of competence. But you people, you know what's going on, you can see better than I, and you just might want to give amateur broadcasting a stab. Personally, I'd rather be at a game, with the true fans, knee deep in mud, beer and blood. But that's not for everybody. So I was coming home on the train from Frankston late Saturday afternoon, and while the waiting times on the Franga line might be lower these days - thank you Sky Rail - the actual train trip itself through suburbs where you wouldn't want to live and suburbs where you couldn't afford to live is just as long as it ever was. How to pass the time? Well, it just so happens that Football Victoria signed up some ridiculous deal to broadcast close to a bazillion of its NPL games probably mostly to indigent gamblers, and it's just my luck that there's one on right at the time I'm travelling. It's Manningham United Blues against Springvale White Eagles, from the Veneto Club for some reason. Manningham is up 1-0, there's half an hour left and no commentary. 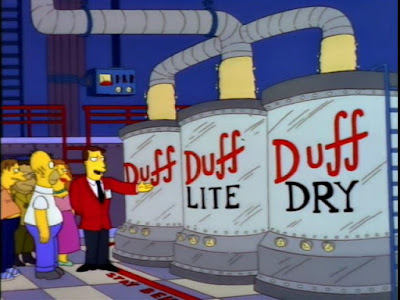 Springvale find a way to overturn the deficit and win the game, and thus begins my bender. Even early in the season, the Somers Street pitch isn't in great shape. 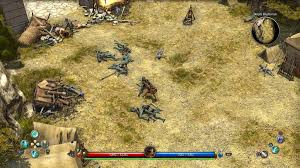 Knowing the score beforehand, but being impatient for someone to upload the condensed highlights, I settled in on the couch on Sunday morning to watch the replay of Knights vs Magic in its entirety, in whatever gap my brothers left open in between another Titan Quest campaign. And I have to say, I was a little disappointed. Granted, that may just be me - not someone who watches full-length soccer matches on television except during the World Cup, nor as someone who ever watches replays these days of matches where they already know the outcome. But this was a 4-3 game, with an implied shifting of momentum, a red card, and reputed great atmosphere. But it felt kind of... flat? Credit to Knights I suppose for not being so honking in the first two weeks of this season as they've been for the past few years, but I'm not quite sure how they scored four times; I do understand how they didn't cop six or seven, what with Magic being wasteful in a way they won't be whenever it is they're due to play us. You'd like to think these kinds of things even themselves out in the end, but they don't. Sunday afternoon, too hot to go outside, so I park myself in an armchair with my dad taking the couch, and him belittling the quality of the players in the St Albans vs Moreland game, comparing it unfavourably to the players in his village team playing back in early 1960s Greece, back when villages like his still had children and young men. But that's my old man in a nutshell; like many people of his vintage who have fallen off the local soccer bandwagon, they live with misty eyed memories of Ulysses Kokkinos and his ψαράκι headers or Gary Cole cracking shots with enough power to kill someone. Me, I have to be subservient to my probably ill-considered and often downright inconvenient principles and take what I can get in this day and age, and not some fast-receding memory of a corrupt idyll of yesteryear. This is another not great game. St Albans have a halftime lead they probably don't deserve. The second half is ordinary if not quite dire - I cut the teams some slack because of the heat - and it is actually improved by the stream cutting out for a good ten minutes or so. The stream returns and the game is going nowhere, until everything gets turned on its head when Moreland score two goals in as many minutes. St Albans manage to level things up by the end, but since my old man has long since left to do something else, did it really matter that the two teams saved up the excitement until the end? They must only come out after midnight. Two weeks in a row at Sunshine station at about 12:30 in the morning, a random starts talking to me about South. This time, not very contemporary discussion, just a bloke who saw my beanie and went "South Melbourne Hellas, that's going way back, Trimmers" etc, etc.